I had an optima before this and it had the same fuel requirement in the owners manual, 87 or higher. It was a turbo optima and i tried premium. It was fwd, and with regular it would smoke the tires off the line if you floored it, but not with premium. Everyone says "turbo cars from what i know need higher octane...93...blah ,blah etc." Thats awesome in EFI cars from the 90s - 2000+. 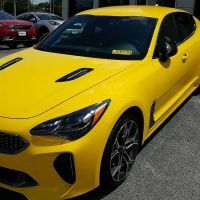 things change, and the reason these KIA engines are more efficient and can run on regular gas is because their GDI with incredible pressure in the fuel systems and a different style of delivery, hence the reason conventional tuning methods don't always exactly work anymore. you might see a little better mpg with premium, but thats only because it doesn't need as much retard. The lower octane pulls more timing to achieve the same result and feels a lil peppier.... but thats only my opinion.. Agreed, the manual says 87 is ok (as a min), but recommends top tier. For those that run tunes(like me), you definitely want to keep parity with what fuel the tune expects. 100% Premium only....there's a reason 93 octane outperforms 91 octane tunes. Heck I'll add WMI hopefythis summer, too. unless you have a race chip the stinger doesn't come with a "93 tune"
100% Premium only....there�s a reason 93 octane outperforms 91 octane tunes. Heck I�ll add WMI hopefythis summer, too. I have a JB4. And I’m willing to bet a stock stinger adds more timing in vs 91 or 87 when using 93 octane.